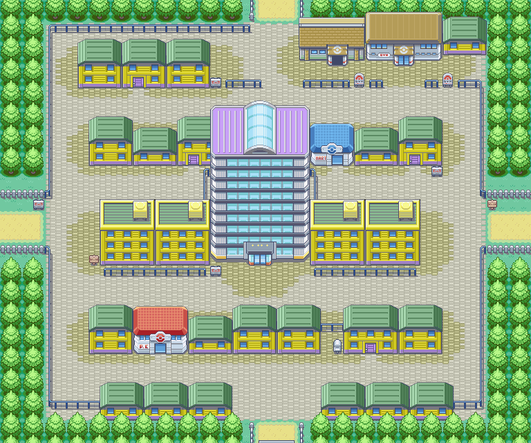 Saffron City is home to the Silph Company, the makers of the fabulous Silph Scope. So how did Giovanni get his paws on the Silph Scope prototype? Is the company in cahoots with Team Rocket? The only way to find out will be to use a little industrial espionage, so get your team built up strong and prepare to go on a stealth mission! Fans of the TV show are probably beginning to notice that the ruthless Team Rocket of the game doesn't have a whole heck of a lot in common with the bumbling idiots depicted on TV. Their mission of world dominance has led them to Saffron City, headquarters of the Silph Company. Team Rocket has basically occupied the entire city, sending respectable citizens running while they force the staff of Silph Co. to make advanced weaponry for their nefarious purposes. In the Southeast corner of town you'll find Mr. Psychic's house. Enter and he will give you TM29 Psychic. Psychic is considered one of the best attack moves in the game as it does a lot of damage, almost always hits, and has a 30% chance of temporarily lowering its target's "Special" statistic. You won't get a badge for taking down this optional Gym, but you will get something just as good: One of two Pokémon that can be found nowhere else in the game. If you've only played the originals, you'll be in for a less-than-pleasant surprise. Beating the Mankeys in this gym is still easy, but thanks to a Generation II fighting move Foresight, the Machops, Machokes, Hitmonlee and Hitmonchan can still decimate your entire party even if you have Ghost Pokémon, so make sure you level your party up plenty before taking on this gym. When you've bested the Karate Master, he'll offer you your pick of his pets. Flying types rule against Fighting ones, so if you've been working on a Pidgey or Spearow, you're in luck. Psychic types are also super effective here. Dark, Normal, Steel, Rock, and Ice types will fare badly here, as Fighting is strong against them all. Hitmonlee, the Kick Pokemon, is the strongest of the two Pokemon you can choose as a reward by beating the Dojo. Hitmonlee's moveset, however, is not very varied and is mostly focused on Fighting moves only. Choose Hitmonlee if you want a fast Fighting Pokemon that can mow down any Normal, Rock, Ice and Steel opponents. Hitmonchan, the Punch Pokemon, has slightly worse stats than his counterpart. However, Hitmonchan has access to Thunder Punch, Ice Punch, and Fire Punch, not to mention his Sky Uppercut can actually hit Pokemon during the turn of Fly or Bounce in which they are usually invulnerable. Pick Hitmonchan if you want a more versatile Pokemon that can hit its opponents with super effective moves. Once you've driven the Rockets away by reclaiming Silph Co., you can enter the house in the upper left corner of town. The little girl who lives here loves to mimic other people. She repeats everything you say, and you won't be able to have a normal conversation with her at all unless you bring her a Poké Doll. If you don't have one, head back to the Celadon Department Store to buy one. Give the Poké Doll to Copycat to be taught the Mimic move in return. This skill automatically repeats the last attack done to you by your opponent. Not always useful, but at least virtually any Pokémon can learn it. Maybe now she'll feel less shy and be able to relate to people normally! 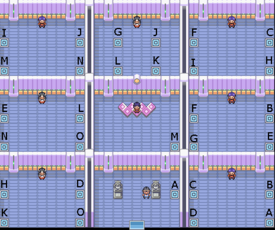 You can't get into Sabrina's Gym until you've saved the Company President within Silph Co. Only then will the Rocket blocking the door go away, and you can enter Sabrina's maze of teleport squares. The least confrontational way to reach Sabrina is to take teleporter A, then walk straight up to B, then down and across and up again to F (stay out of the sight range for the trainer), then straight down twice to I and M. You can avoid the trainer fight all together if you hug the bottom wall as you go from B to F.
Bug Pokémon are strong here, so a Parasect or Butterfree should be okay against Alakazam. The best way is to take advantage of her Psychics' weak defense with strong Ground, Flying, or even Normal Pokémon. Dugtrio and his Dig and Earthquake works well, as well as Raticate's Super Fang, which cuts the Pokémon's HP in half. Sabrina also has two Hyper Potions that will restore her Pokémon's HP completely, as well as a Full Heal, so be prepared for that. Mr. Mime also knows the Baton Pass move, which will randomly switch it out with one of Sabrina's Pokémon. Defeating Sabrina will net you the Marsh Badge, which gives you the ability to command Pokémon as high as level 70, although you're not likely to have need of such power for quite some time. Sabrina will also gift you TM04 Calm Mind. This page was last edited on 5 February 2018, at 19:32. This page has been accessed 880,486 times.